Here we report a novel method to extract nucleic acids for virus detection. Plant tissue in a filter paper sandwich was hit with a hammer, and the crude sap was adsorbed by the filter paper, as in hammer blotting for tissue-print immunodetection of plant viruses. Nucleic acids were extracted from the paper with a guanidine-containing buffer and purified through standard extraction and precipitation. Both viral and cellular RNAs in the extracted RNA were detectable by RT-PCR. The blots can be stored at 4 °C for more than a few days to detect viral RNA, but not cellular RNA. The online version of this article (doi: 10.1007/s10327-016-0673-8) contains supplementary material, which is available to authorized users. 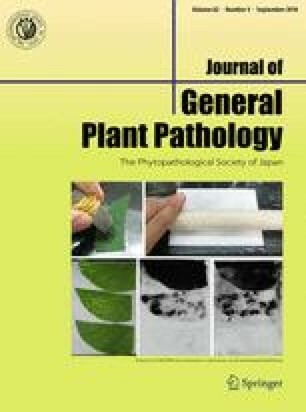 This study was supported in part by the United Graduate School of Agricultural Sciences, Ehime University, JSPS KAKENHI Grants Nos. 24658044 and 15K14664. MSA was supported by MEXT, Japan.